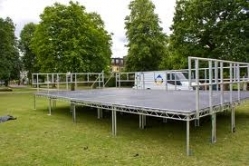 Stages similar to those in the pictures are very strong and flexible as they can be erected on uneven grass or hard surfaces using our adjustable legs. Both stage panels we use are considered to be the industry standard and can take large amounts of weight. Full load bearing calculations are available. Steeldeck or Litedeck panels are used to construct the platforms which are 2.4 M x 1.2 M and topped with a plywood surface and painted black. Various performing heights can be achieved by our stock of 1 M , 2 M and 3 M legs. Truss frames and canopies can be added to these platforms. 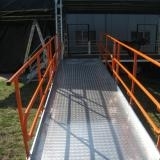 One of the ramps that we hire for making access on to the stage easier.